I caught the end of the 2017 Piece and Plenty Quilt Guild "Bed Turning" session in time to see this lovely vintage Butterflies and Flowers handmade quilt. It was love at first sight, and you can see why, there are a variety of different-sized butterflies all over the applique flowers! June is usually the month for National Pollinators Week and this year, it will be celebrated June 18-24. Butterflies are among the many pollinators who keep our landscapes full of a variety of flowers not to mention the largest family of pollinators, bees. This vintage quilt has its own celebration, starting with the variety applique butterflies all over. There are two sizes of butterflies, the larger dominant applique ones and the smaller ones forming a border. And in one of the quilt corners, a delightful surprise, the name of the quilter and the year she made it hand-embroidered: Dot French, 1984. I had a butterfly quilt in my teenage years, a patchwork butterfly quilt pattern with more details than this one. Taking a closer look, it would not be hard to make a similar butterfly quilt, the applique butterfly shape is pretty simple as are the flowers. Looks like the longest time would be in embroidering the flower centers and leaves. 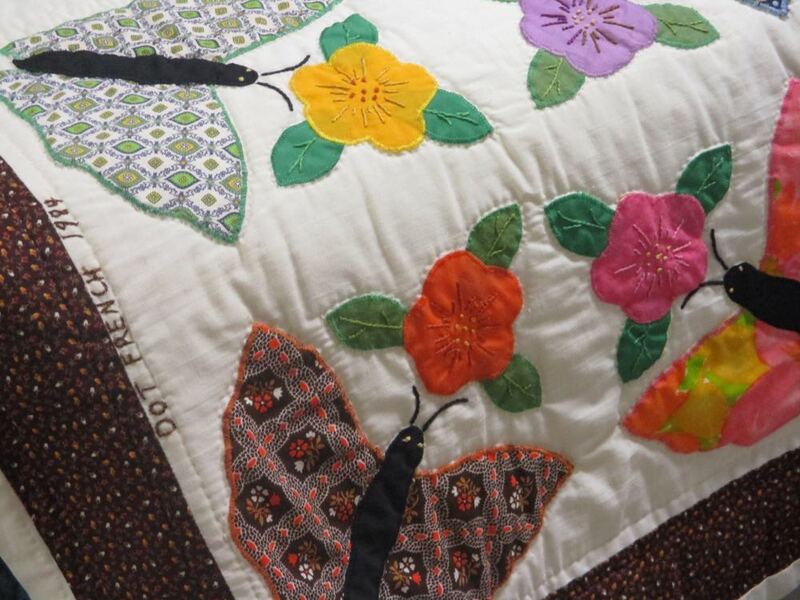 I have been contemplating making a new butterfly throw design and this vintage butterflies and flowers handmade quilt will definitely be my inspiration!